Welcome to the Crafty Chicks Blog Hop! We're so glad you could join us. We 're a group of creative gals who met on the WWW (gotta love the internet) and decided to come together and share our passion for paper crafting with you. Each month we have a different theme. This month our theme is "Sparkling Season". It's December so of course it's all about the sparkle! When I found out the theme was 'Sparkly Seasons' I knew what I wanted to showcase. This is a card I made a while ago and I love it. It's using a technique called 'Split Negative' stamping. It works best with a stamp that looks good split down the middle. You stamp and emboss the image twice using two different colors (I used silver paper/black embossing and black paper/silver embossing). Once done, split both images down the middle and then place one half of each together to form a new image. So you'll get two focal images. The wooden stamp is from Stampendous called 'Tinsel Tree'. To be eligible to win our fabulous prize you need to leave a comment on each one of our blogs and indicate you have done so in the Rafflecopter below and answer the following question "What is your favorite item from the Holiday Gift Guide"? by checking out the guide by clicking HERE . There are many other optional entry choices too. One way to earn an extra entry for our giveaway this month is to create a Sparkling Seasons project and post the photo on our Facebook event HERE. We hope you'll give it a try. Good luck! 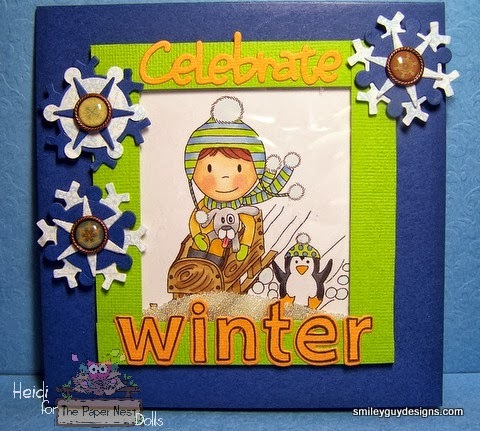 Next on the stop is Piali's blog...check out her amazing project HERE. If you're having a good time with this blog hop make sure to follow us on our blogs, Facebook, or any other social media the designers have set up. Also, please feel free to share with your friends. Hello my friends. Sorry I've been a little MIA lately. I've been super busy with work lately and I haven't had a chance to work on any crafty projects. I'm afraid if I don't get back to it soon I'll forget how to color! LOL! But I'm hoping that will change soon. I'm on vacation next week and I SO NEED IT. 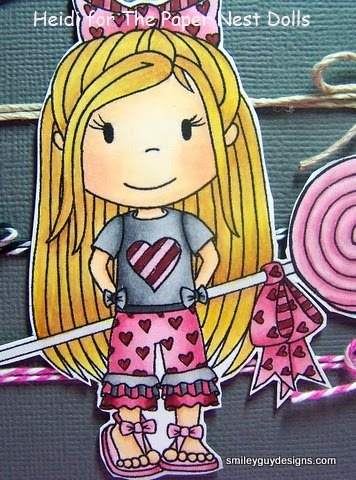 The image I used for my card is called 'Lollipop Ellie'. She's colored with COPIC markers. The card is very simple - I cut small notches on either side of the card to hold the twine as I wrapped it around and then tied in a bow. I fussy cut the image and used foam adhesive to pop her up for dimension. I stamped the sentiment (from Paper Smooches Slang Gang collection) and hand cut the banner edges. Bing, Bang, Boom and it's done!!!! 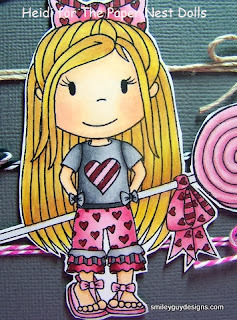 Here's a close up of little 'Lollipop Ellie' You can't see it too well in these pictures but I used my new Wink of Stella pen to add a little bit of shimmer to the lollipop and the heart on her shirt. Instead of listing all the COPIC markers I used and labeled, I decided to show them instead. I've seen others do this and decided to give it a try. I love my hot pink bucket. If you celebrate Thanksgiving I hope you have a great day spending it with loved ones and friends! Hello my friends! It's time for another challenge with the Paper Nest Dolls. 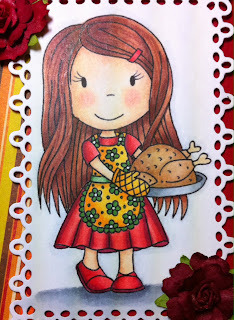 'Giving Thanks' is Challenge #17 and runs from today, 11/11/13 until 11/22/13. See challenge details HERE. Now you can't have a challenge without prizes. There will be a top three that will win one digi of their choice and then one grand prize winner who will win a $20 gift certificate to The Paper Nest online shop. Click HERE to visit the store. I'm having problems with my laptop so I had to get creative with getting this post done with pictures. I took pictures with my phone, sent them to my work laptop, signed in to my work laptop and downloaded the pictures so I could attach them here. Now the card I made uses the digital image called 'Thanksgiving Avery' - can't you just smell the turkey???? She's colored with COPIC markers and the papers are from Bo Bunny 'Apple Cider Collection' which is from last year but I love, love, love the colors. 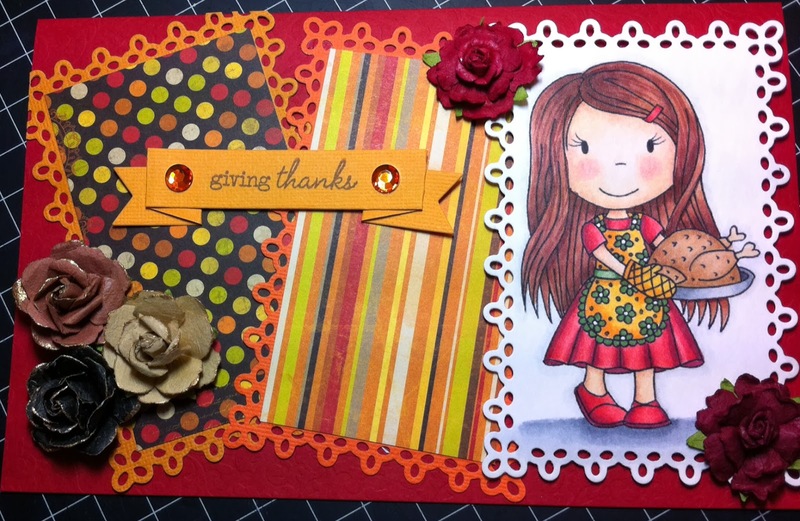 I used a Spellbinders Nesting Doily Rectangle die to frame the image and cut a couple of mats. I love the banner which is from Simon Says Stamp called 'Folded banner'. It's so cute!!! The size of this card is rather large at 5.5 x 8.5. . Here's the a close up of Avery! That's is for now......thanks for stopping by and I hope to see you again soon - and I can't wait to see what you create. Hello my friends! It's time for another Paper Nest Dolls challenge. The theme for PNDC #16 is 'Anything Goes' Challenge. The challenge begins today, 10/28 and ends on Friday 11/8. What's a challenge without prizes - there are 4 winners in total for each challenge - 3 winners chosen by our design team and these winners get one free PND digi of their choice (which let me tell you will be hard to pick since all the images are so darn adorable) - and 1 randomly chosen winner who will receive this awesome prize package...and by awesome I mean AWWW-SOME!!!!! 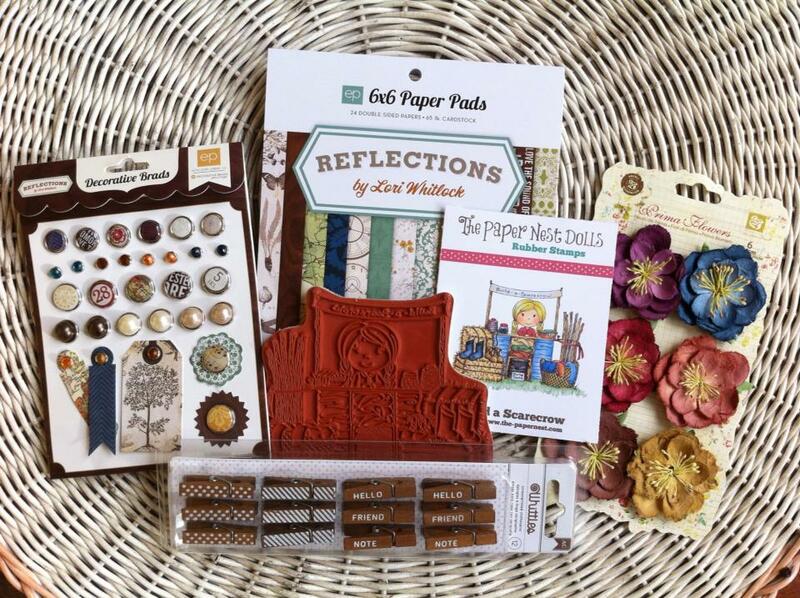 The prize for this challenge is a $25 gift certificate to The Paper Nest Dolls online store. It's good for either online or red rubber stamps. Check out all of Christine's doll images at The Paper Nest store HERE. The theme this time is an 'Anything Goes' challenge. A month or so ago I submitted this pocket card for a magazine submission and it wasn't selected...dag-nab-it.....but on the flip side...it's a perfect card for the 'Anything Goes' challenge. I used two Paper Nest Dolls images for the bride and groom 'Bride Ellie' and 'Aristocrat Owen'. I colored the images with COPIC markers (see list of colors at bottom of post) and then cut them out. Here is a close up of the bride and groom. 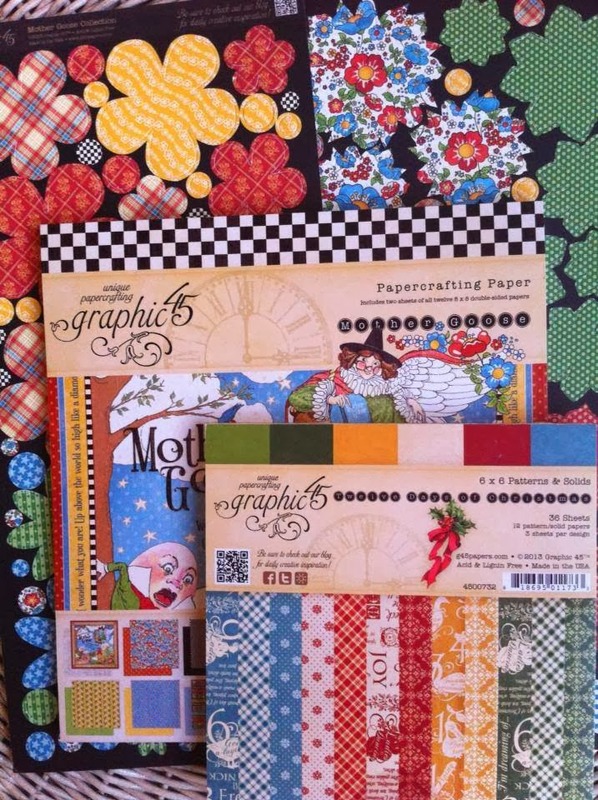 The papers used are by Tim Holtz from his 'Vintage Shabby' 12x12 paper pack. The sentiments are a collage of phrases from the 'Sentiments' collection by Paper Smooches. The main sentiment is from Hero Arts 'Just Find Me' collection. You are not required to use a PND stamp in order to participate but with the popularity of Christine's images why wouldn't you want to? Thanks for stopping by and hope to see you again soon! I look forward to seeing what you create!! We're doing things a bit different over the next 2 days. Instead of having the same write up for everyone on the hop we're all going to do our own write ups and if you want all the official BLOG HOP information you can go to The Paper Nest Dolls Blog. There you'll find a sneak peak of the new Nursery Rhyme collection as well as information on prizes available to win. You should have come to my blog from Cathia's blog and if you get lost along the way you can find the complete order by using the link above for The Paper Nest Dolls blog. This blog hop is a TWO day hop and there are a TON of bloggers participating in it so you're going to see some fabulous projects along the way. Now, I'm originally from Florida and yes, we've actually gotten snow before but it is no where near what I get now living in Wisconsin. I adore the FALL season and I love winter. I must admit I'm not too thrilled with the ice, but the snow is beautiful, peaceful and fun to play in. So, I was excited when Christine (owner and illustrator of these wonderful dolls) gave me the image "Downhill Racing Owen" as the image to work with today. This is the first time I've ever made a shaker card. I watched all kinds of videos on youtube on how to make these (gotta love the internet). Here's my finished project. I'm not sure you can see the 'shaker' part in the picture above so I took a close up of the microbeads used. Since this was my first time with a shaker card I was a little frugal with the beads....I could have used a bit more - but note to self - once you put the shaker part together, it WILL NOT come apart so you can add more beads....live and learn. The image is colored with COPIC markers and I used Quinn's ABCs with the matching dies and some snowflake dies from Spellbinders. The next stop in the hop is Valerie's and her blog is ValbyDesign. All the images we've used in our projects are available in The Paper Nest store. 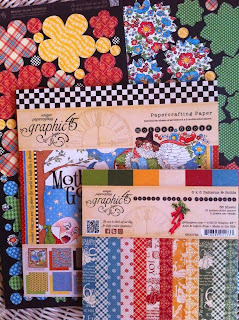 I hope you enjoy this blog hop over the next two days and if you leave some blog love on EVERY stop for BOTH days you could win some amazing prizes from May Arts, Doodlebug, Graphic 45 and more. Winners will be announced on Friday, October 18. As a special treat, Christine will have a free digital image for everyone who completes the hop as well. Hello my friends! Today's a busy day for us at The Paper Nest Dolls. 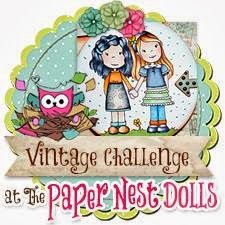 It's time for another Paper Nest Dolls challenge. The theme for PNDC #15 is 'Halloween' Challenge. The challenge begins today, 10/14 and ends on Friday 10/25. 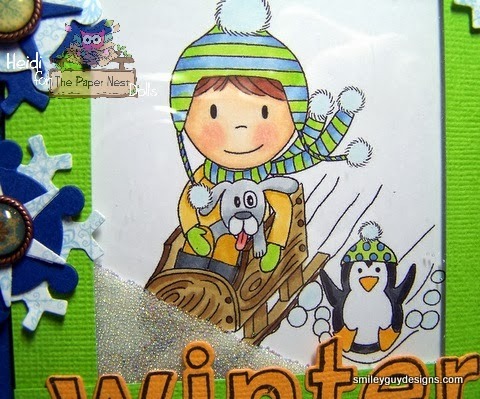 AND.....it's also day 1 of our 2 day Winter Blog Hop. Make sure to check out both posts. 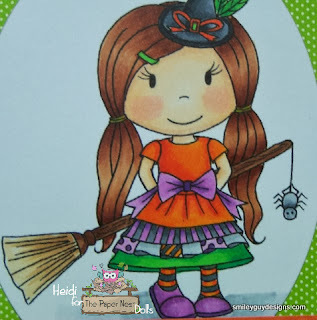 Christine (owner and illustrator of Paper Nest Dolls) has some really cute Halloween images and I've used "Little Witch Ellie'. 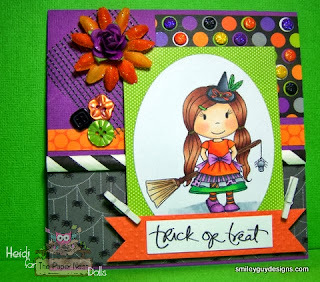 She's colored with COPIC markers and I've used Doodlebug papers from their 'Haunted Manor' collection. I love the paper with the little spiders on it...kind of matches the little spider hanging from Ellie's broom. Too cute! 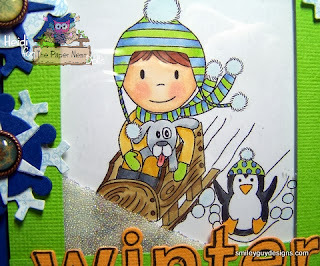 Also....don't forget to check out our 2 day Winter Blog hop for your chance to win some great prizes. 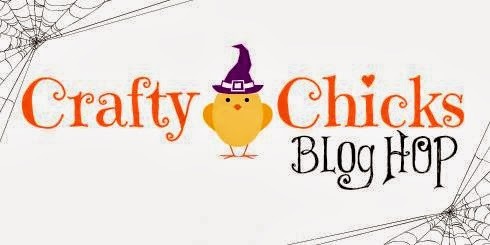 Welcome to the Crafty Chicks Blog Hop! We're so glad you could join us. 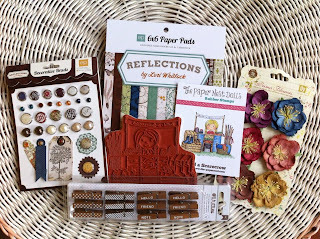 We 're a group of creative gals who met on the WWW (gotta love the internet) and decided to come together and share our passion for paper crafting with you. Each month we have a different theme. This month our theme is "All Hallows Eve". It's October - what did you think it was going to be? LOL! If you're coming from Julie's blog you're in the right place. This is a full circle hop and I'm the last stop but just in case you get lost or want to see the full line up you'll find it here on Elizabeth's blog. I love the wonderful images by Krista Smith, owner and illustrator of Saturated Canary. This little beauty is called 'Witchy Waitress' and she comes with a few sentiments as well. She is colored with a TON of Copic Markers (if anyone wants the list of colors used just leave me a comment and I'll list them out). 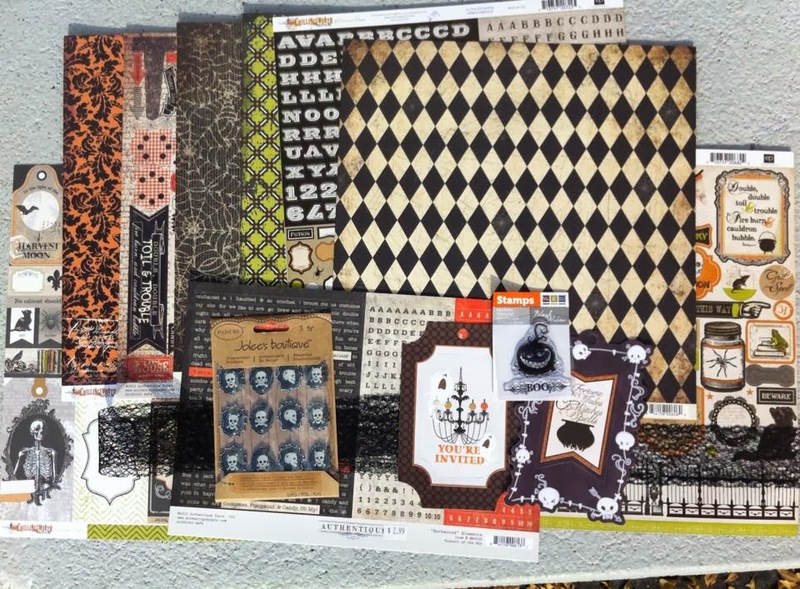 The designer papers are from a Doodlebug collection called "Haunted Manor". 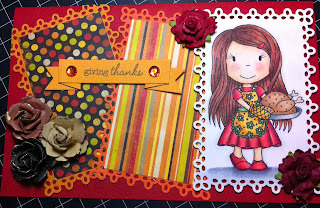 I fussy cut the waitress, used a circle and square punch and a button and some brads from my stash and then just banner cut some strips to different lengths to create this cute card. 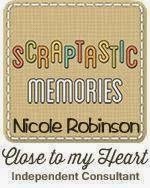 Our sponsor this month is one of our own Crafty Chicks....Nicole. She is an independent consultant for Close to My Heart and she is offering a $25 gift certificate for the lucky prize winner. To be eligible to win our fabulous prize you need to leave a comment on each one of our blogs and indicate you have done so in the Rafflecopter below. You will also need to visit Nicole's shop and do a search for 'Halloween' and tell us "What your favorite Halloween item is". There are many other optional entry choices. 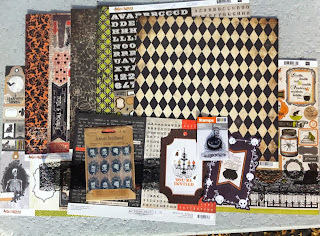 One way to earn an extra entry for our giveaway this month is to create a Halloween project and post the photo on our facebook event. We hope you'll give it a try. Good luck! Hello my friends! It's time for another Paper Nest Dolls challenge. The theme for PNDC #14 is 'Vintage' Challenge. The challenge begins today, 9/30 and ends on Friday 10/11. What's a challenge without prizes - there are 4 winners in total for each challenge - 3 winners chosen by our design team and these winners get one free PND digi of their choice (which let me tell you will be hard to pick since all the images are so darn adorable) - and 1 randomly chosen winner who will receive this awesome prize package. When I saw the theme for this challenge I was a little worried. I'm not really a vintage kind of girl, so what was I going to create????? 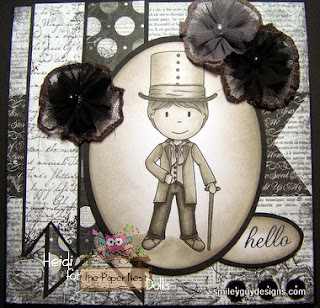 After some serious thinking I came up with an idea.....vintage to me means old, and old to me means black and white - so I colored my image in shades of gray (a monochromatic look) and then used blacks and grays for the papers. 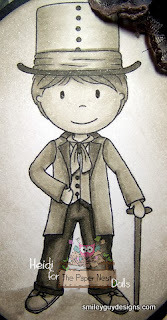 The adorable image I used is called 'Aristocrat Owen' and he is colored with COPICS. Since he's monochromatic it's an easy list of COPICS to post! C0, C1, C3, C5, C7 and C9. Hello my friends! It's time for another Paper Nest Dolls challenge. The theme for PNDC #13 is 'Fall' Challenge. The challenge begins today, 9/16 and ends on Friday 9/27. What's a challenge without prizes - there are 4 winners in total for each challenge - 3 winners chosen by our design team and these winners get one free PND digi of their choice (which let me tell you will be hard to pick since all the images are so darn adorable) - and 1 randomly chosen winner who will receive this awesome prize package. This prize package is special because it's the first time Christine has included a rubber stamp. 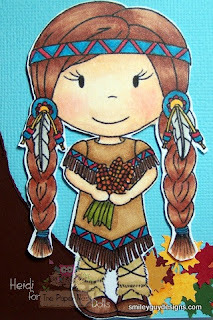 Just a note to the winner - you can pick any of her fall themed stamps - it doesn't have to be the one pictured below (although it is pretty cute)! Christine, the owner and illustrator of the Paper Nest Dolls has some wonderful images for Fall but I had something else in mind. I used her image called 'Give Thanks Ellie'. I had pictured in my mind that I wanted to show a tree with lots of fall colored leaves. So I cut some brown cardstock into a tree shape and then punched out a TON of leaves using many different fall colors. I love that Ellie is dressed in her little Indian dress and while this would be a perfect image for Thanksgiving I thought I could use her for Fall as well. I think they call that creative license. She is colored with COPIC markers and then fussy cut - I used foam adhesive to pop her up to give her dimension. 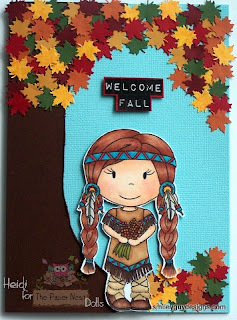 The 'Welcome Fall' sentiment is made using Tim Holtz label letters.